Shoot more, reload less. This 22-round Mag is ready to deliver round after round to your trusty Glock. Durable Zytel® polymer construction and stainless steel spring for years of service. Removable baseplate. 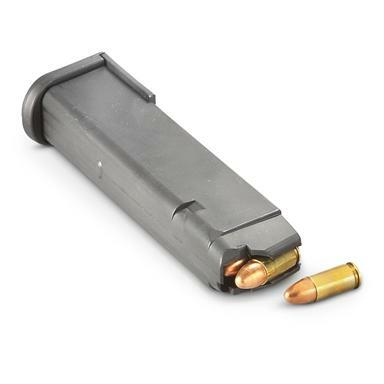 Thermold Glock 9mm Magazine, 22 Rounds is rated 3.9 out of 5 by 30. Rated 1 out of 5 by GDAN from I BOUGHT 3 OF THE THESE BECAUSE PRICE WAS GREAT. BAD MISTAKE, SECOND TIME I WENT TO RANGE, ONE FAILED TO FEED REALLY BAD. ALMOST EVERY ROUND. THE OTHER TWO, SEVERAL ROUNDS FAILED TO FEED. LOOKED AT THE SPRINGS AND WAS CORRODED. $50.00 WASTED. MY GLOCK 17 AND GLOCK 19 WAS AS DISAPPOINTED AS I WAS. Rated 5 out of 5 by Trainman from Great Price for these mags. These are good for my needs when I need them. Rated 4 out of 5 by Marvin from So far very reliable Put approx 200 rounds thru my Glock 17, months problem. Would feel confident at this time carrying them at work. Rated 5 out of 5 by Firedoc from Long, Lean and Loaded Durable, loads like OEM, spring tensioned just right, locks into place and feeds like it should. No metal liner, but I don't care and the gun sure doesn't care. Rated 4 out of 5 by Kevin from Solid and functional Bought two and used them at the range one time so far. Both loaded in my 9mm carbine easily and fed every round. Last round hold open worked with both mags. Rated 5 out of 5 by Striketc1 from This is the first 22 round mag that I have purchased. It functions flawlessly and is made of quality materials. It is nice to have a few extra rounds loaded, more shooting and less down time at the range. Rated 4 out of 5 by Richard from Fits my Glock 19 gen 4 great, have not had an opportunity to go to the range yet, but because of the extra length of the magazine extending from the weapon I wouldn't use it when I carry. It should be great at the range with the seven (7) extra rounds or for home protection.